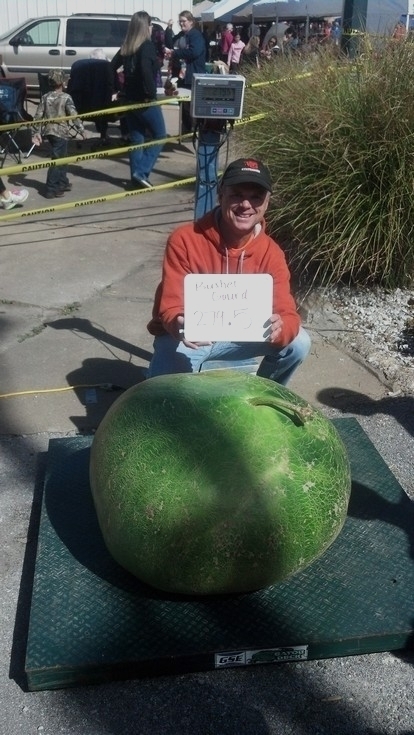 2014 - Doug English and his 279.5 pound World Record Bushel Gourd! BigPumpkins.com congratulates Doug English on his 279.5 pound bushel gourd weighed at the Republic Pumpkin Daze weigh-off in Republic, MO. Doug grew his record bushel gourd on the 177 Westfall 2012 seed and sibbed it with another 177 Westfall. If you were lucky enough to see this bushel gourd and take a digital picture please upload to the Photo Gallery (not your personal diary) to have your photo included on this page!